PCGamer.com has launched – with one of the world's most important gaming magazines arriving for an online audience. Like TechRadar.com, PCGamer.com is part of Future Publishing, and takes advantages of teams in both the US and UK to being PC gaming fans news, reviews and previews. 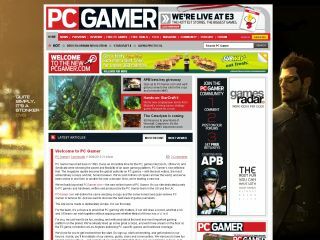 Editor-in-Chief of PC Gamer US, Logan Decker and Editor of PC Gamer UK, Tim Edwards are heading up the project – and the goal is to be a key bookmark for PC gamers. Logan Decker, Editor-in-Chief of PC Gamer US, said: "The community demanded a fully featured PC Gamer website, and we've been committed to doing it right, teaming up with Tim and his team across the pond. "The new site we have launched is just the beginning for PCGamer.com. We are working on features and exclusives that will grab the attention of passionate and technology savvy PC gamers. "With more than 15 years as the global PC gaming authority, no other editorial team is better equipped than PC Gamer to be the most trusted, most informed and most up-to-date online source for all things PC gaming." Tim Edwards, Editor of PC Gamer UK, added: "PC Gamer is proud of what we've achieved in print over the past 15 years. "Now is the chance for us to remind the world just how fun, silly, and smart PC Gamer can be, 24 hours a day. "We know the community wants this, and we're bursting with ideas, and passion for the world's most important gaming platform."